Participants in the Panetta Institute programs go on to pursue a wide variety of academic and professional goals, with many finding opportunities in public service. 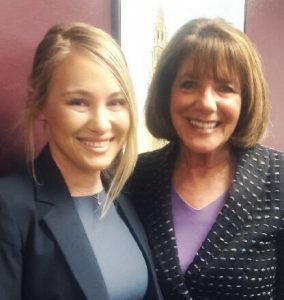 One alumna, Jessica Dockstader, a Panetta Institute Congressional Intern participant in 2016, and an intern for Congressman Steve Knight, (R) 25th District, California, later became an intern for Congresswoman Susan Davis, (D) 53rd District, California. Following her internships she was admitted to the Masters of Arts Peace and Justice program at the Joan B. Kroc Peace and Justice center at the University of San Diego. Paul Ramey, a participant in the Panetta Institute’s Congressional Internship Program in 2012, is now a legislative aide to state Assemblyman Jim Wood (D-Healdsburg), and he credits his success to the training he received at the program. Mr. Ramey described how he set aside his original plan for a career in finance as a result of his internship. After returning from Washington and graduating from Sonoma State University, he served as campaign manager for Assemblyman Wood and later joined him in his Sacramento office as a communications officer. Alumna Rebecca Lorentz, who received a Masters of Public Policy from the Panetta Institute in 2010, is a research assistant in the Department of Defense Analysis at the Naval Postgraduate School in Monterey. With the Naval Postgraduate School she studies the subjects of terrorism and analytics. Using network and visual analysis, her research focuses on the sociological and demographic elements that affect domestic gang membership and gang-related crime. She has written on the complexity of these social issues as representative of what are known as “wicked problems,” and has served on the research team whose study, “Gangs & Guerrillas” explores the overlap between counterinsurgency doctrine and anticrime strategies. Previously, she served as editor of a county newsletter that focused on air quality, housing needs and population shifts. David Abella (Panetta Institute congressional intern, 2005) is associate general counsel at Alameda Health System. He attended UC Berkeley Law School (Boalt Hall). James Ahumada (Leadership Seminar participant, 2010 and Panetta Institute congressional intern, 2011) is ASI senior communications manager at California State University Long Beach. Nicole Alvarado (Leadership Seminar participant, 2005) is the government software coordinator at Computer Information Concepts, Inc., Wichita, Kansas. Nicole Anderson Rimal (Leadership Seminar participant, 2011) is a legal assistance attorney in the United States Marine Corps. Natalya Anfilofyeva (Panetta Institute congressional intern, 2002) is vice president, U.S. Operations, Free Russia Foundation in Washington, D.C.
Jennifer Ansberry (Panetta Institute congressional intern, 2009) is compliance officer at the U.S. Department of Labor, Office of Federal Contract Compliance Programs, Los Angeles. Hafiza Arikat (Panetta Institute congressional intern, 2010) is a consultant at Deloitte management consulting in Washington, D.C. She also has served as a Department of Homeland Security liaison officer to the United States Department of State’s Center for Strategic Counterterrorism Communications. Artemio Armenta (Panetta Institute congressional intern 2001) is a public information officer with the Office of Public Affairs & Media Relations at the California Department of Motor Vehicles. Cynthia Ashton (Leadership Seminar participant, 2011) is a teacher and international programs coordinator with Nishiyamato International Education Center in Southern California. Cecille Asuncion (Panetta Institute congressional intern, 2003) is an administrative services manager for the county of Los Angeles and a viola player for the Orchestra Santa Monica. Erin Bala (Panetta Institute congressional intern, 2005) is a brand manager for the WD-40 Company in San Diego. Jordan Ball (Panetta Institute congressional intern, 2012) is a regional representative for United States Senator Bob Casey, Jr, (D-PA). Janet Barnes (Master of Public Policy graduate, 2006) is a political consultant and a former Salinas City Councilmember. Cristina Barron (Panetta Institute congressional intern, 2006) is vice president of programs for Big Brothers Big Sisters of the Bay Area. Rony Berdugo (Panetta Institute congressional intern, 2009) is a lobbyist for the League of California Cities. Michael Bernier (Panetta Institute congressional intern, 2005) is a budget policy analyst in the office of the United States Department of Human Services. Jacques Bertrand (Master of Public Policy graduate, 2011) is a council member for the city of Capitola. Kenneth Beurmann (Leadership Seminar participant, 2006) is chief executive officer at Terrio Physical Therapy-Fitness Inc. in Bakersfield. Ezekiel Bonillas (Leadership Seminar participant, 2003) is director of economic development at Twenty Nine Palms Band of Mission Indians in Palm Springs. Julianne Brands (Panetta Institute congressional intern, 2011) is an associate at Oregon Angel Fund in Portland, Oregon. Joel Bridgeman (Leadership Seminar participant, 2006) is a principal at Community Engagement Solutions in Washington, D.C.
Ramsey Brown (Leadership Seminar participant, 2009) is resource acquisition manager at Hawaii Energy, an energy conservation and efficiency program administered by Leidos Engineering, LLC. Melissa Burnell (Panetta Institute congressional intern, 2011) is an executive assistant at Pivotal Ventures, the executive office of Melinda Gates in Seattle. Kiana Buss Valentine (Panetta Institute congressional intern, 2003) is legislative representative at the California State Association of Counties in Sacramento. Anneka Busse (Leadership Seminar participant, 2005) is a crisis therapist/care manager at Claremont University Consortium, Monsour Counseling and Psychological Services. Ian Caliendo (Panetta Institute congressional intern, 2005) works in state agency relations for Pacific Gas & Electric (PG&E). Vincent Carr (Leadership Seminar participant, 2010) is travel coordinator at the Naval Postgraduate School. Pablo Castro (Panetta Institute congressional intern, 2011) is a technology administrator at Sands Capital Management in Seattle. Brandon Chapin (Leadership Seminar participant, 2009) is a program analyst for the Sacramento-San Joaquin Delta Conservancy. Mary Ashley Cherney (Panetta Institute congressional intern, 2015) recently completed her first year in Teach for America and is working on a master’s degree through the Teach for America partnership with Loyola Marymount University. Paula Clamurro (Panetta Institute congressional intern, 2002) is an attorney and fellow at Neighborhood Legal Services in Los Angeles. Jordan Ciliberto (Policy Research Fellow, 2010) is an attorney in Santa Cruz. Amanda Collins Diefenderfer (Leadership Seminar participant, 2008) founded and owns Big Red Marketing company in San Luis Obispo. Sean Connelly (Leadership Seminar participant, 2010) is communications director to California Assemblymember Freddie Rodriguez (D-Pomona). Gina Cortese (Policy Research Fellow, 2010) is an associate attorney at Hanson Crawford Crum, a San Francisco Bay Area law firm. Monica Cortez-Hernandez (Leadership Seminar participant, 2012) serves as a legislative assistant for California Assemblymember Rudy Salas (D-Bakersfield). Stacie Dabbs (Panetta Institute congressional intern, 2003) is deputy executive director at the Merced County Association of Governments. Judy Darnell (Master of Public Policy, 2006) is vice president of public policy for the United Ways of California. Martha Diehl (Master of Public Policy graduate, 2006) is a partner and co-founder of Carmel Canine Sports Center, a start-up business dedicated to developing an athletic club for people and dogs together, supporting a wide variety of healthy and fulfilling activities for families that include dogs. She is also a Monterey County planning commissioner. Jessica Dockstader (Panetta Institute congressional intern, 2016) is an intern with United States Representative Susan Davis (D-San Diego). Wesley Dodd (Panetta Institute congressional intern, 2012 and Policy Research Fellow, 2014) is an associate at the law firm of Ropes and Gray in San Francisco. Brandon Dowling (Panetta Institute congressional intern, 2009) is program manager at Molina Healthcare, UCLA Luskin School of Public Affairs. Laura Enderton-Speed (Panetta Institute congressional intern, 2002) is assistant director and supervising attorney of governmental affairs at the Judicial Council of California. Lyla Englehorn (Master of Public Policy graduate, 2010) is a research associate at the Naval Postgraduate School in Monterey. Katy Erker-Lynch (Leadership Seminar participant, 2007) is Community Builder and Relationship Manager at ThinkCERCA, a Chicago-based education company. Erik Fallis (Leadership Seminar participant, 2002) is a director of executive writing and a speechwriter for the Chancellor’s Office, California State University. Ellen Farmer (Master of Public Policy, 2006) is Support Coordinator at Open Farm Tours, California State University at Monterey Bay. John Fiske (Panetta Institute congressional intern, 2003) is a senior trial attorney at the Gomez Law Firm in San Diego. Kirsten Foster (Panetta Institute congressional intern, 2012) is Girls and Women Advocacy Officer at United Nations Foundation in Washington, D.C.
Anthony Gallino (Leadership Seminar participant, 2014) is a J.D. Candidate, 2019 Suffolk University Law School in Quincy, Mass. Aaron Garavaglia (Panetta Institute congressional intern, 2012) is a summer associate at Squire Patton Boggs in Washington, D.C.
Evelyn Garcia (Panetta Institute congressional intern, 2003) is a program officer in the financial stability department for the United Way of Greater Los Angeles. Neil Gibson (Leadership Seminar participant, 2003) is the economic officer at the United States Embassy in Tokyo. Jason Gomez (Panetta Institute congressional intern, 2005) is vice president and senior marine underwriter for Swiss Re Corporate Solutions in Orange County, California. Katrina Gonzales (Panetta Institute congressional intern, 2003) is deputy county counsel, county of Sacramento. Laura E. Gonzalez Nelson (Leadership Seminar participant, 2011) is account director at idmloco, a Sacramento public relations firm. Debra Gramespacher (Master of Public Policy, 2012) is a systems engineer at Northrop Grumman Corporation in Monterey and a trustee on the Monterey Peninsula Unified School District Board. Eric Guerra (Leadership Seminar participant, 2002) is a Sacramento City Council member. Anthony Guntermann (Leadership Seminar participant, 2007) is a mechanical engineer and consultant at Metabolic Maintenance in San Diego. Angela Hacker (Panetta Institute congressional intern, 2003 and Leadership Seminar participant, 2001) is division chief for energy and sustainability initiatives, County of Santa Barbara. Jode Hamilton (Panetta Institute congressional intern, 2003) is program manager in the Executive MBA Department at the University of San Francisco. Adam Haverstock (Leadership Seminar participant, 2007) is director for government affairs and tourism at the Greater Conejo Valley Chamber of Commerce. Jenny Holland (Panetta Institute congressional intern, 2006) is an assistant professor of politics and government at Ohio Wesleyan University. Julie Hopper Lata (Panetta Institute congressional intern, 2009) is director of global community affairs at Applied Materials in Mountain View, California. Kendra Howell (Master of Public Policy graduate, 2011) is director of the Salinas Valley Memorial Hospital Foundation. Amelia Hukoveh (Panetta Institute congressional intern, 2002) is senior corporate counsel at SAP, a business services company in Washington, D.C.
Carlos Illingworth (Leadership Seminar participant, 2003) is director, public affairs and communications at Coca-Cola North America in Los Angeles. Ryan Jacobsen (Leadership Seminar participant, 2001) is chief executive officer at the Fresno County Farm Bureau. Camille James (Panetta Institute congressional intern, 2004) is an IT Administrative Analyst at Contra Costa Superior Court. Andrew Janz (Leadership Seminar participant, 2007) is a deputy district attorney in Fresno County and a Democratic nominee for Congress. Megan Jones (Master of Public Policy graduate, 2013) is a senior program manager at Rincon Consultants, Inc., an environmental services firm in Monterey. Adam Jorge (Panetta Institute congressional intern, 2010) is the national coordinator for the Clean Water Act Grants Reporting and Tracking System for the United States Environmental Protection Agency. Kelli Kedis Ogborn (Leadership Seminar participant, 2004) is president and CEO of H.S. Dracones LLC, a business consulting company in Washington, D.C.
Arno Keshishian (Leadership Seminar participant, 2006) is a partner at the law firm of Manookian and Keshishian in Los Angeles. Sarah Kirwan (Panetta Institute congressional intern, 2009) is owner and consultant of SK Designs Colorado, a strategic communications firm in Denver, Colorado. Tomasz Kolodziejak (Leadership Seminar participant, 2010) is co-founder and chief operating officer at Inteliclinic, a Silicon Valley electronics company. Andrew Kress (Panetta Institute congressional intern, 2010) is a senior associate at Deloitte Management Consulting in Washington, D.C.
Nancy Landa (Leadership Seminar participant, 2003) is a migration scholar and public relations specialist in Mexico City. Conor Lansdale (Leadership Seminar participant, 2010) is a manager and analyst supporting the F-35 mission systems for Northrop Grumman Corporation. Julie Lata (Panetta Institute congressionall intern, 2009) is program manager of Global Community Affairs at Applied Materials in Santa Clara. Justin Lauka (Leadership Seminar participant, 2006 and Americorps Vista member, 2005 and 2006) is an associate director and program director of the Clinical Mental Health Counseling Program at Adler University in Chicago. Roy Lee (Leadership Seminar participant, 2006) is a consultant specializing in marketing for Accenture in Washington, D.C. and serves as his firm’s co-lead within their federal practice. Jeff Leieritz (Panetta Institute congressional intern, 2007) is a senior communications advisor at the federal General Services Administration. Sydney Lewis (Panetta Institute congressional intern, 2012) is a field representative in the Sacramento office of United States Senator Kamala Harris. Jeffery Lind (Policy Research Fellow, spring 2014) is an associate attorney at L+G, LLP Attorneys at Law in Salinas. Alex Lopez (Leadership Seminar participant, 2002) is director of practice marketing solutions at Alphaeon Corporation, a lifestyle healthcare company in Irvine, California. Joseph Lopez (Leadership Seminar participant, 2010) is a publicity assistant at the Richard Nixon Foundation located at the Nixon Presidential Library and Museum in Yorba Linda, California. Kristen Love Boscia (Leadership Seminar participant, 2002) is a lawyer in private practice in San José. Maria Love (Master of Public Policy graduate, 2012) is director of the Office of Immigration Relations for the county of Santa Clara. Grant Mack (Leadership Seminar participant, 2010) is senior legislative liaison for the Office of Governmental Affairs, California Public Utilities Commission. Christopher Marklund (Panetta Institute congressional intern, 2006) is the associate legislative director for public lands at the National Association of Counties in Washington, D.C.
Teressa Martel Nakamoto (Panetta Institute congressional intern, 2006) is director of strategic partnerships at Reality Changers, a non-profit organization in San Diego. Katie Martin (Panetta Institute congressional intern, 2010) is senior associate for global health advocacy at the United Nations Foundation. Maribel Martinez (Leadership Seminar participant, 2002) is manager of the Office of LGBTQ Affairs, County of Santa Clara and an adjunct professor in Mexican American studies at San José State. Andrew Martz (Master of Public Policy graduate, 2012) is a creative director, video producer and editor for Entropic Productions in Eugene, Ore. In 2011, he led a study on the use of new media for implementation by the county of Monterey. Joy Masha (Leadership Seminar participant, 2008) is a field representative for California State Senator Holly J. Mitchell (D-Culver City). Mackee Mason (Leadership Seminar participant, 2008) is the principal at Austin Achieve public school in Austin, Texas. Mitchell Matthews (Master of Public Policy graduate, 2013) is project coordinator for Prevention First at California State University, Monterey Bay. Erica Maybaum (Panetta Institute congressional intern, 2010) is a legislative aide to Supervisor Norman Yee of the San Francisco Board of Supervisors. Nicole McAllister (Panetta Institute congressional intern, 2014) is an executive assistant/scheduler for United States Representative John Garamendi (D-California). Megan McCourt (Panetta Institute congressional intern, 2011) is a senior account executive at PPR Worldwide, a public relations company in New York City. Ashley McDougald (Panetta Institute congressional intern, 2011) is assistant to the vice president and chief information officer at the University of San Francisco. Kelly McMillin (Master of Public Policy graduate, 2006) recently retired as the chief of police for the city of Salinas. Edward (Ted) McNamara (Panetta Institute congressional intern, 2008) is an attorney with Fowler White Burnett in Miami/Fort Lauderdale. Natalie Mendoza (Panetta Institute congressional intern, 2003) is a visiting lecturer in the University of California Berkeley History Department. She completed her Ph.D. in history at UC Berkeley. David Mier (Panetta Institute congressional intern, 2006) is the government and community affairs coordinator for the University of California San Diego Health System. Ron Miller (Leadership Seminar participant, 2007) is commanding officer of the United States Coast Guard patrol boat Washington, homeported in Santa Rita, Guam. Chelsea Minor (Leadership Seminar participant, 2005) is director of public relations and public affairs for Raley’s supermarkets in California. Alexandra Mitchell Bostick (Leadership Seminar participant, 2008) is senior associate of major and planned giving at Hospice Brazos Valley, Texas. Mona Mohammadi (Leadership Seminar participant, 2005) is an account director for Capobianca and Associates public relations agency in Los Angeles. Previously, she was a special assistant to California Governor Arnold Schwarzenegger. Yadira Molina (Panetta Institute congressional intern, 2014) is graduate admissions counselor and is attending George Washington University’s graduate level Elliott School of International Affairs. Jennifer Moody (Leadership Seminar participant, 2005) is assistant director of chapters and groups at the Santa Clara University Alumni Association. Michael Motroni (Leadership Seminar participant, 2005) is an associate civil engineer at Wood Rodgers Inc., an engineering, planning, surveying, and mapping consulting firm headquartered in Sacramento. Roujin Mozaffarimehr (Policy Research Fellow, spring 2013) is an attorney at Goeschl Law Corporation of San Francisco. Lucy Nguyen (Leadership Seminar participant, 2011) is an account executive at GA Creative, a marketing company in Bellevue, Washington. Jennipha-Lauren Nielsen (Leadership Seminar participant, 2010) is a motivational speaker at The ONE World Project in Los Angeles and founded Lipsticks & Laptops, a program specifically targeting young girls and minority youth to explore science and technology. She is also commissioner for accessibility and disablity for the city of Pasadena. Jennifer Nieto (Panetta Institute congressional intern, 2012) is a legislative and grants research assistant at CapitalEdge Advocacy, Inc., a Washington, D.C. consulting firm that represents local governments. She is responsible for researching and coordinating federal grant opportunities and tracking federal legislation. Eric Niu (Leadership Seminar participant, 2011) is a consultant for Deloitte, a management consulting company in Washington, D.C.
Keith Ochwat (Panetta Institute congressional intern, 2005) is managing director at the Documentary Foundation, a non-profit organization that produces character-driven feature films. Priscilla Ocen (Leadership Seminar participant, 2002) is an associate professor at Loyola Law School in Los Angeles. Hironao Okahana (Leadership Seminar participant, 2005) is director, statistical analysis and policy research for the Council of Graduate Schools in Washington, D.C.
Daniel Oliver (Panetta Institute congressional intern, 2008) is vice president of development at the National Asian/Pacific Islander American Chamber of Commerce & Entrepreneurship in Washington, D.C.
Derric Oliver (Policy Research Fellow, spring 2011) is an associate attorney for Fenton & Keller, a Monterey law firm. Raisa Orleans (Panetta Institute congressional intern, 2007) is a policy analyst at the Environmental Defense Fund in Washington, D.C.
Abel Pacheco (Leadership Seminar participant, 2009) is director of strategic engagement at the University of Washington’s Mathematics, Engineering, Science Achievement (MESA) program. Nick Parrish (Leadership Seminar participant, 2011) is an associate governmental program analyst at the California Department of Corrections and Rehabilitation. Sofia Pereira (Leadership Seminar participant, 2008) manages the She Should Run Incubator, a nationwide community of women preparing to run for office and a city council member for the city of Arcata. Noel Perez-Sanchez (Panetta Institute congressional intern, 2008) is a member outreach assistant at the United States House of Representatives Democratic Caucus. Will Pickering (Panetta Institute congressional intern, 2004) is manager for communications at the Pittsburgh Water and Sewer Authority. Diana Pillsbury (Panetta Institute congressional intern, 2010) is a self-employed advocate for persons without housing in Washington, D.C.
Manolo Platin (Leadership Seminar participant, 2004) is vice president, state government and industry affairs, Western Region, for Chubb insurance company. Elena Ponyaeva (Panetta Institute congressional intern, 2008) is a project manager for Management Systems International, a Washington, D.C.-based international development firm providing specialized short- and long-term technical assistance in more than seventy countries. Cris Powell (Leadership Seminar participant, 2007) is director of development, student affairs and university programs at California State University, Fullerton. Valerie Poynor (Leadership Seminar participant, 2006) is an assistant professor of statistics at California State University, Fullerton. Legal Services in Palo Alto. Teresa Rabenberg (Leadership Seminar participant, 2003) is an executive search consultant for the North Stella company in San Francisco. Rashelle Rasmussen (Panetta Institute congressional intern, 2008) is an office manager at Energy 2001, Placer County’s largest green power producer. Robin Ray (Panetta Institute congressional intern, 2011) is an energy industry analyst for Visiongain, in London. Visiongain is an independent business information provider for telecoms, pharmaceutical, materials, energy, automotive and defense industries. She has attended the London School of Economics and Political Science. Monica Rea (Panetta Institute congressional intern, 2003) serves as deputy director of administration of the California Department of Fair Employment and Housing, the largest state civil rights agency in the nation. Jennifer Reimer (Leadership Seminar participant, 2004 and 2005) is in-house counsel for LG Electronics Middle East and Africa, based in the United Arab Emirates. Terra Rentz (Panetta Institute congressional intern, 2008) is program coordinator at Roosevelt Wild Life Station in Syracuse, New York. Meriam Reynosa (Panetta Institute congressional intern, 2006) is a senior district representative for California State Senator Bob Wieckowski (D-Fremont). Rex Richardson (Leadership Seminar participant, 2005) is a council member for the ninth district and vice mayor for the City of Long Beach. Diego Rios (Leadership Seminar participant, 2015) has helped guide a leadership conference in Beijing, China, for the California Association of Student Councils. Bruce Robbins (Panetta Institute congressional intern, 2005) is a project coordinator at the Sonoma County Economic Development Board. Erin Rodriguez (Panetta Institute congressional intern, 2014) is a California policy advocate at the Union of Concerned Scientists in Sacramento. Megan Roehl (Panetta Institute congressional intern, 2008) is a social worker for the County of Santa Clara. John Roitz (Master of Public Policy graduate, 2011) is a water resources technician for the Monterey County Water Resources Agency. Kelsey Rugani (Leadership Seminar participant, 2009) is a senior associate at Kearns & West, a woman-owned collaboration and strategic communications firm founded in 1984. Its projects include work at local, state, regional, and national levels and cover a variety of sectors including energy, water, marine resources, land use and natural resources, government, business and academia, and technology. Brian Russ (Master of Public Policy graduate, 2011) is an estate planning attorney at the Law Offices of Brian D. Russ in West Sacramento. Angelica Sagum (Panetta Institute congressional intern, 2011) is the business development manager at Chevron Energy Solutions in Los Angeles. Safa Sajadi (Leadership Seminar participant, 2005) is an attorney in the general counsel’s office of Credit Suisse in Raleigh, North Carolina. Justin Salters (Panetta Institute congressional intern, 2011) is a senior account executive at Russo McGarty & Associates in Bakersfield and a contributing columnist at the Bakersfield Californian. Joy Salvatin Lee (Leadership Seminar participant, 2008) is an engineer at Flometrics engineering firm in San Diego. Kristopher Sanchez (Panetta Institute congressional intern, 2001) is the director of international trade for the state of Nevada. Darcel Sanders (Panetta Institute congressional intern, 2008) is chief of staff at Teach For America-California Capital Valley in Sacramento. Esmeralda Santos (Leadership Seminar participant, 2005) is direct representation attorney at Kids in Need of Defense (KIND) in San Francisco. Annie Selak (Leadership Seminar participant, 2004) is a Ph.D. student at Boston College. Jean-Simon Serrano (Panetta Institute congressional intern, 2002) is an associate attorney at Heiting & Irwin in Los Angeles. Joseph Shearer (Panetta Institute congressional intern, 2002) is a planner for AKS Engineering and Forestry company in Oregon. Jillian Shweiki (Panetta Institute congressional intern, 2011) is finance operations director at the Democratic Congressional Campaign Committee in Washington, D.C.
Vivek Sridharen (Policy Research Fellow, 2008) is a music and digital media attorney at Counsel LLP in San Jose. Kat Skiles (Panetta Institute congressional intern, 2006) is message mobilization director for the Democratic National Committee. José Solache (Leadership Seminar participant, 2001) is community and government relations director for the Oldtimers Foundation, a Los Angeles-area non-profit that provides home delivered meals to seniors. He is also a city councilmember for the city of Lynwood. Kristina Solberg (Panetta Institute congressional intern, 2011) is press secretary for United States Representative Jim Costa (D-California). Brandon Soublet (Panetta Institute congressional intern, 2007) is a communications consultant supporting the U.S. Department of Health and Human Services for DAI Solutions in Arlington, Va.
Russel Statham (Leadership Seminar participant, 2007) is chief financial officer at the Girl Scouts of Central California South. Stephanie Stone (Panetta Institute congressional intern, 2006) is a presidential management fellow and program analyst at the United States Department of Housing and Urban Development. Emily Surface Fife (Leadership Seminar participant, 2007) is marketing manager at CBRE Global Workplace Solutions (GWS) in Summerland, Ca. Alexandra Swan (Panetta Institute congressional intern, 2010) is a senior analyst, executing strategic plan development and implementation for the Coast Guard’s Research, Development, Test and Evaluation Program at JPI, a Washington, D.C.-based management consulting company. Kiyana Tabrizi (Leadership Seminar Participant, 2011) is program manager for strategic data solutions at Apple. Matthew Troncali (Panetta Institute congressional intern, 2007) is a lawyer at Bremer, Whyte, Brown & O’Meara in Newport Beach. Laura Tsutsui (Panetta Institute congressional intern, 2016) is a reporter and producer at Valley Public Radio, an National Public Radio affiliate radio station in Fresno. Matthew Vacca (Panetta Institute congressional intern, 2006) is the dean of academic affairs at the New Community Jewish High School in Los Angeles. Joe Vaccaro (Leadership Seminar participant, 2005) is senior product line director, cloud services, at Citrix Systems in the San Francisco Bay Area. Joel VanderVeur (Panetta Institute congressional intern, 2006) is network real estate manager and an attorney for Mobilitie, a telecommunications company in Georgia. Mark Vanni (Panetta Institute congressional intern, 2004) is a deputy city attorney for the city of San José. Martine Watkins (Master of Public Policy graduate, 2009) is the mayor of the city of Santa Cruz. She was elected to the City Council in November, 2016. Heather Ashly Williams (Leadership Seminar participant, 2006 and 2007) is strategic initiatives coordinator for the After School Division of the California Department of Education. Marc Wirtz (Panetta Institute congressional intern, 2009) is director of the emergency department at Garfield Medical Center in Southern California. Joshua Wood (Leadership Seminar Participant, 2004) is CEO of Region Business of Sacramento, a building trade association. Manal Yamout (Panetta Institute congressional intern, 2003 and Leadership Seminar Participant, 2004) is senior vice president of policy at Advanced Microgrid Solutions, an energy services company in San Francisco. Erin Ziegler (Panetta Institute congressional intern, 2003) is in-house counsel at Eric Warren Goldman Consulting, LLC, in San Francisco. Previously, she was assistant general counsel at the United States Department of Justice, Federal Bureau of Investigation and the Office of General Counsel. If you are a former Panetta Institute student, share your accomplishments with us at the Institute. E-mail us at Info@PanettaInstitute.org and provide us with your current mailing address and other contact information.